Collectively, the program team functions as our leadership team — facilitating and leading camp-wide activities. The leadership team is comprised of the Assistant Program Director, Senior Counselor(s), Adventure Specialist(s), Arts and Crafts Specialist, and Music Specialist. The Adventure Specialist is the go-to guy or gal for the more intense and adventurous activities around camp. While they will not be the only person trained in leading these activities around camp (we train as many of our counselors and leadership team as possible), they will be taking lead on much of the setup, cleanup, and execution of these tasks. For our younger camps, these activities include a nature based lesson or activity in the morning, and leading adventurous activities in the afternoons, such as hikes, with helping hands from our other staff. For our older campers, the Adventure Specialist will typically lead a morning nature activity similar to our younger camps, and will head up the various ropes elements, rock wall, canoeing, and/or longer hikes, again with help from our other summer staff members. At times when there are not any adventure activities going on, the Adventure Specialist serves on the Program Team, the group of staff that help run all programs around camp. Being a member of the Program team includes lending a hand with set up for camp activities, helping with special worship services, leading group games, and making announcements to our campers. We hire 2 adventure specialists. This position is currently filled for the summer of 2019. The Arts and Crafts Specialist is in charge of coordinating and executing all crafts for our summer programs, though there is much more to the position than that, as the Arts and Crafts Specialist is a member of the Program Team. As a member of this team, they will meet daily to figure out how to best help and serve the programming needs of camp. Though this is often leading crafts, at times when no crafts are being offered, the Arts and Crafts Specialist will assist however they are best able. This list often includes set up for camp activities, helping with special worship services, leading group games, and making announcements to our campers. Crafts take place either in the mornings or as an “afternoon option,” a time during which campers sign up for their favorite activities in up to three time slots, then show up and participate in their desired activity. For our older campers, the Arts and Crafts Specialist will also be asked to lead a seminar on art and how it can or does relate to faith, usually lasting between an hour and an hour and a half. We hire 1 Arts and Crafts Specialist. Our Music Specialist is often one of the most known and favorite faces of camp: it is a job that does well with an optimistic and positive attitude. The Music Specialist has a lot of responsibilities at camp, starting with the week of staff training when they are responsible for putting together a praise band and putting together a portfolio of praise songs (we have many resources here, they just need to be fine tuned to the Music Specialist’s liking). This may sound like a daunting task, but we typically have many talented musicians on staff very eager to help lend their talents to the praise band. The other music heavy time is the nightly campfire, which is a mix of silly and traditional Tall Timber sings (and any the Music Specialist wants to introduce!) followed by some more calming music to set the tone for the speaker to deliver the message each night. In addition to these fixed times that we always have music, there are also various special occasions throughout the summer when music is appreciated, and the Music Specialist is always the go to. In addition to these responsibilities, the Music Specialist is also part of the program team, meaning that they help make sure that all of the programs run throughout the day by lending a hand when they have one to give. Afternoon options happen daily, a time when kids sign up for their favorite activities and go do them. The Music Specialist helps run these as they are able (BMX, ropes course, hiking, etc.) and occasionally offer a music option (drum circle, jam session, etc.). 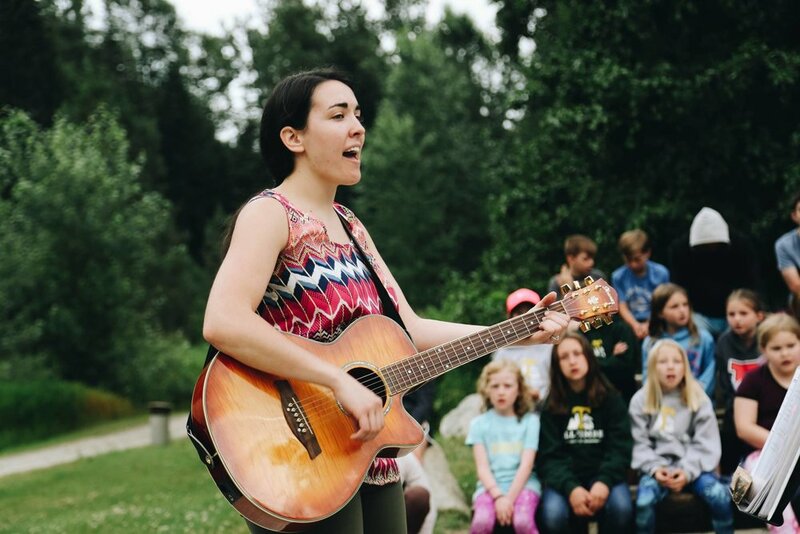 For our older camps, the music specialist will be asked to develop a seminar on music and faith, or something similar. The Music Specialist, like all positions at Tall Timber, is dynamic in nature and takes a lot of heart, drive, energy, and love. We hire 1 Music Specialist. Want more information? Have any “Q’s”? Contact Zachary.